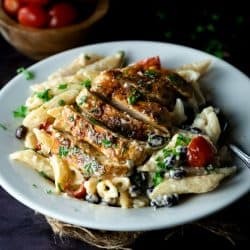 Perfectly seared chicken smothered with taco seasoning and served over Alfredo pasta along with your favorite taco ingredients! 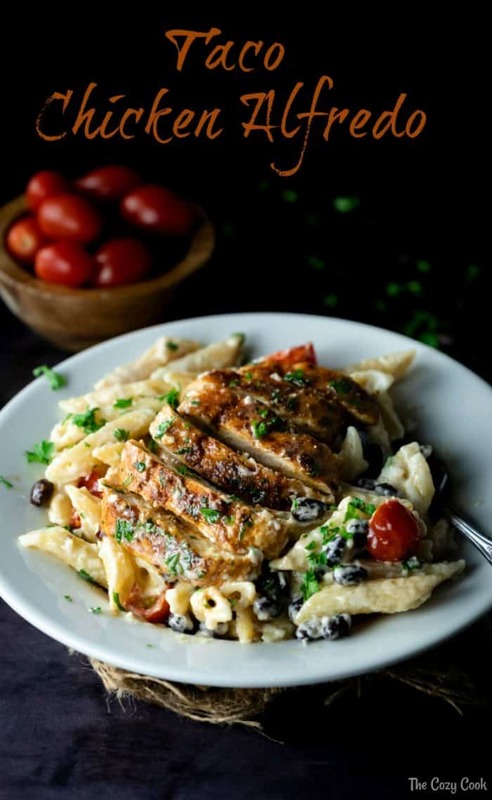 Black beans and pasta might not be something you typically combine, but trust me, it’s time to be adventurous. It’s absolutely amazing. You might not even make regular Alfredo pasta ever again. Alright, let’s start with the delicious, perfectly seared chicken. 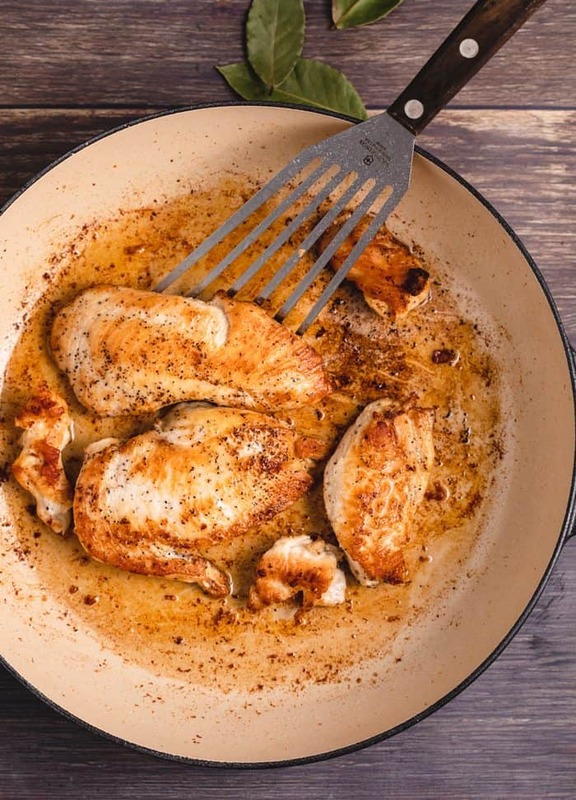 What Does it Mean to Sear Chicken? Searing chicken is the process of cooking it in a hot skillet until the surface area of the chicken develops a crispy browned crust. -This makes the chicken more visually appealing as it adds greater depth of brown on the outside. -It also creates a differentiation in texture between the softer inside of the chicken vs. the crisp outside. 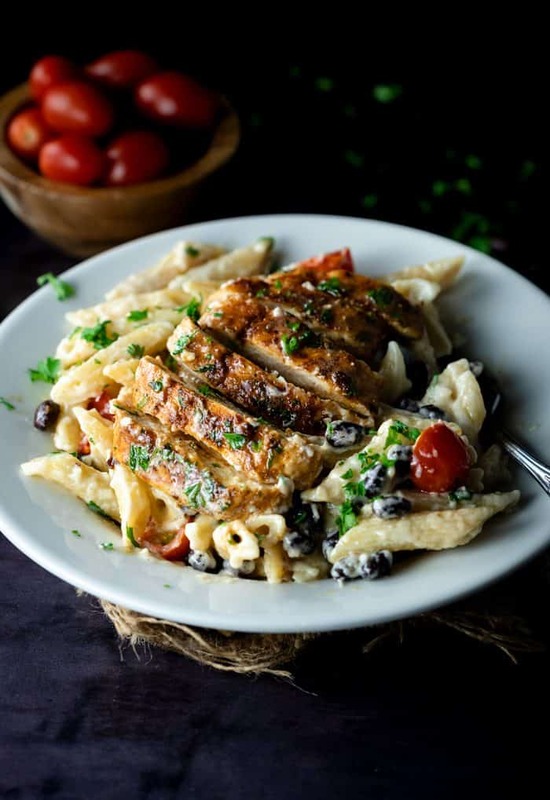 -The brown flecks of cooked chicken left in the skillet adds excellent flavor to the rest of the dish when the same skillet is used. ✔️Cast iron skillets conduct heat very well and are perfect to use when searing meat. ✔️Medium-high heat works well for searing, and it’s important to use oil with a high smoke point such as vegetable, canola, or peanut oil to prevent the meat from burning. ✔️It’s important to refrain from moving the meat around as it cooks. Allowing the meat to stay in the same place in the skillet ensures that the sear isn’t disrupted. You’ll notice that the chicken starts to release from the surface when it’s ready. If it’s sticking a lot to the pan, it’s not done searing. ✔️Butterfly the chicken and cut the seam to create two thinner slices of equal size. This will allow them to cook evenly and prevent them from being too thick. ✔️Don’t be afraid to season that meat and really get some flavor on there! Some of it will flavor the pan itself which will work it’s way into the sauce that you’ll cook in the same pan. –Shred the cheese yourself. Buy your cheese in blocks whenever possible and shred it at home. They’ll taste better, and the’ll definitely melt better. –Let the cheese come to room temperature. Room temperature cheese melts so much better. -Sprinkle flour over the cheese prior to adding it to the warm base. This helps to thicken the water that separates from the cheese once it begins to heat up. 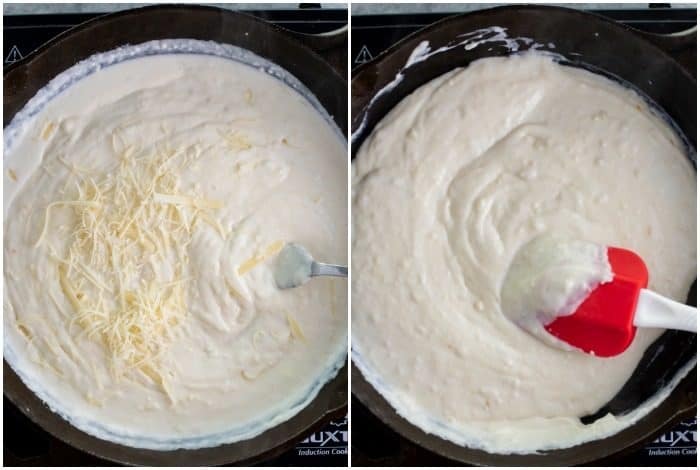 -Reduce the heat of the base before you add the cheese. If the liquid is too hot, the fat from the cheese will separate too quickly and the consistency will be grainy or clumpy. –Add the cheese gradually as opposed to all at once. Stir to combine as you do so. ⭐PRO Tip: Don’t cook the penne too far in advance. Penne is very sticky immediately after it’s cooked and it will absorb the sauce much better if it’s mixed with the sauce right after it’s been drained. …Alright, that’s it, time to hit the streets. Or the kitchen, rather. And hey, add whatever taco additions that you like and share your ideas with me! Go crazy! You should join my free email list and be the first to know about my latest recipes! I sent out just one email a week so you won’t get sick of me. And while you’re at it, I’d love for you to like my Facebook Page and follow me on Pinterest and Instagram too! Shred the Parmesan cheese and set aside. It should be at room temperature when you add it to the pan. In a large cast-iron skillet, heat the remaining 2 tablespoons of vegetable oil on medium-high heat. Butterfly the chicken breast and cut the seam to create 2 thinner slices, each about an inch thick. Season the chicken generously with taco seasoning. Once the oil is heated and glistening, use kitchen tongs to add the chicken to the pan. Be careful of oil splatter. Don’t touch the chicken for a good five minutes to allow the chicken to sear. Once the chicken begins to release a bit from the bottom of the pan, it’s ready to flip. Make sure it has a nice golden brown color prior to flipping. You may need to decrease the heat slightly while the other side sears. Once done, remove the chicken from the pan and set aside. Leave the oil and chicken remnants in the pan as it will give the sauce added flavor. Begin boiling the penne according to package instructions. Proceed in preparing the sauce while it boils. Temper the half and half by warming it in the microwave for 30 seconds. 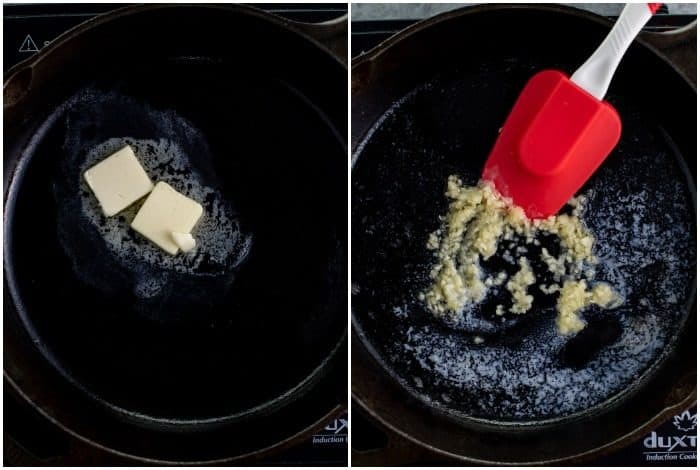 In the same pan over medium heat, melt the butter and use a spatula to release some of the browned bits from the bottom of the pan. Whisk in ONE tablespoon of the flour and let it heat for 60 seconds, stirring continuously. Gradually add the half and half, whisking continuously. 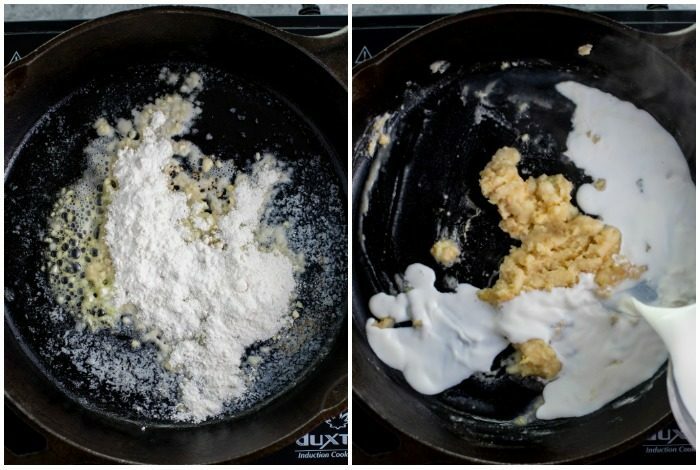 Continue to whisk if there are any clumps of flour. They will eventually dissolve. Sprinkle the remaining tablespoon of flour onto the Parmesan cheese and toss to coat. Gradually whisk in the Parmesan cheese, stirring continuously until the sauce is thick and well-combined. Use a silicone spatula to mix the pasta into the sauce. Add in the diced tomatoes and black beans. Top the dish with the seared chicken, heat for a minute or two, top with cilantro, and serve! ⭐PRO Tip: Don't cook the penne too far in advance. Penne is very sticky immediately after it's cooked and it will absorb the sauce much better if it's mixed with the sauce right after it's been drained. I made this tonight and it was fantastic! Hubby and I both loved it. I’ll be making this a lot. Hey Barb! That is such great news, I am so happy that you enjoyed it as much as well did- it’s almost surprising how well the flavors blend together! Thank you for taking the time to let me know what you thought of it!